DocX Viewer is a handy tool for viewing Word 2007,2010 document without any version of MS Word. Many users haven't upgrade their MS Word to 2007, and some have no Word installed at all. But they may received Word 2007,2010 document in DOCX format from outside. This tool is designed for them to read these DOCX files. Version 1.35 is a freeware program which does not have restrictions and it's free so it doesn't cost anything. 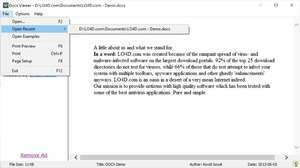 For security reasons, you should also check out the DocX Viewer download at LO4D.com which includes virus and malware tests. Additional screenshots of this application download may be available, too.